Montenegro is blessed with more than her share of canyons and rivers. Her most famous canyon is Tara which has a river by the same name running through it. The Tara River Canyon or Tara River Gorge is often hailed as the deepest canyon in Europe and the second deepest in the world behind (or just above) the Grand Canyon. More than 80 km long, the river provides some excellent spots for whitewater rafting. As a result, rafting Tara is a great whitewater adventure for the die-hard rafting enthusiast, adventurous free spirits, or a group of friends or family looking to have a memorable, bonding experience. Tara River has a degree of difficulty that varies with the calendar and weather. Depending on the amount of snow in the winter and the time when it begins melting, the river levels and swift water rises. 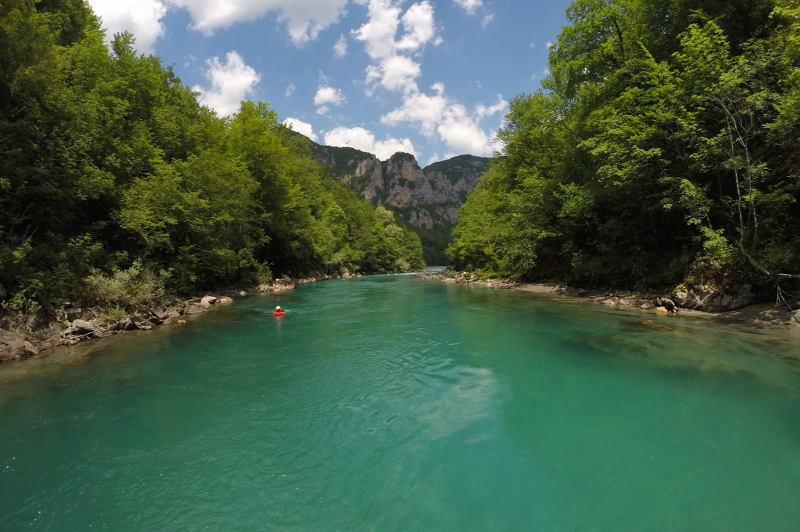 In April and May, the Tara River in Montenegro often has class IV rapids while in the summer and Fall months it is usually class III+ rapids. In spite of these waters plunging over rocks, the water is still pristine. Tara River is clear and beautiful. It makes for great photography and video as well as providing a source of cold, potable drinking water all along the way. Because of its natural beauty and call for adventure, Tara fits with the rest of the Durmitor National Park surrounding it. We went out with campers on a raft, hydrospeeders, and a kayak. If you have rafted and haven’t tried a hydrospeeder yet, you may want to get more into the rapids on one of these boards. It takes the intensity up another notch. We made our way down 18 km of rapids and some calmer spots. Along the way we took in water falls and found swimming holes and jumping off spots along the way. 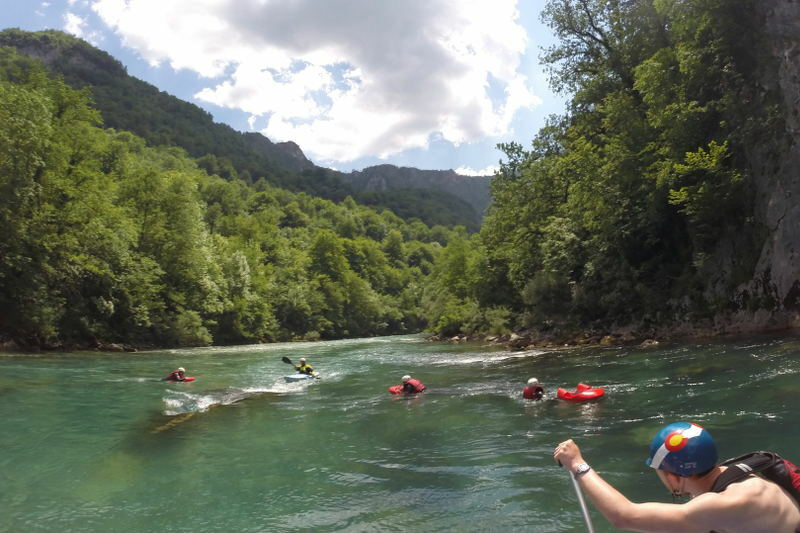 Some of the more challenging rapids on this run include: Borovi, Varda, Celije, and the Vjernovica Buk rapids. In addition to the normal vacation months, the rafting season continues well into the Fall months as late as October depending on weather. Rafting as early as April and May is also doable most years, but these conditions are for the more trained or more daring whitewater adventurers.